Many people enjoy arts and crafts but never take that extra step to make them available for sale. If you’re crafty and have the time and space to make your craft items in larger quantities, there are a variety of items you can create to sell for extra money from home. In fact, with a little planning, you can build a complete home business using your own creative skills. A home crafts business isn't for everyone, but it's a nice way to generate some extra income and, at the same time, receive accolades for your beautiful creations. If you want to start selling your items, you'll also have some administrative business tasks to deal with. It's best to plan from the beginning how you'll accomplish these tasks, such as bookkeeping, generating customer receipts, finding suppliers, and filing business taxes. 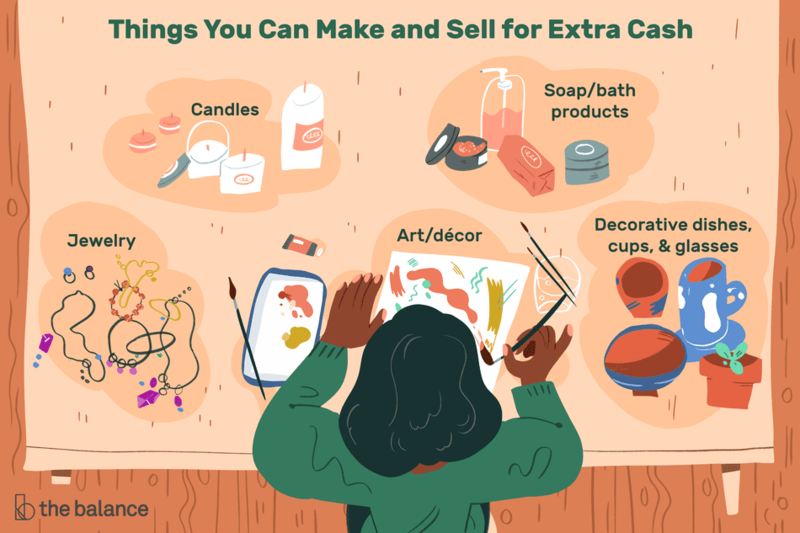 If making money from your creativity sounds fun, exciting, and full of potential, here are 10 ideas on crafts you can make and sell, plus tips on how and where you can sell your hand-crafted goods. Quality home-made jewelry is very popular because each item is usually unique. An advantage to jewelry is that it’s small and easy to pack to take to craft fairs and/or ship if you sell online. Materials for jewelry can vary to include handmade polymer clay beads, stones, metal, crystal, leather, and more. People enjoy unique works of art to display in their home and office. Art doesn’t have to be a painting. It can include photographs, wall hangings made from fabric, or other items, wall stickers and more. Further, it doesn't have to hang on a wall. You can make decorative items that sit on a mantle or bookshelf. There’s nothing like a good soak in the tub. Handmade soap and bath products are popular, especially if they’re created for sensitive skin and made with organic products. You can make regular bar soap, or get molds and dies to create shapes and colors. You can add scent to your products as well. Beyond soaps you can make bath bombs, bubble bath, wash clothes, and lotions. These items can also generate repeat sales because they're consumable. Similar to soap, you can make candles in a variety of shapes, colors, and scents. Further, you can use different unique items to house your candles such as mason jars, teacups, and shells. If you know how to sew, there are many things you can create and sell, such as purses, coin pouches, and bags, pillow covers and blankets, pot holders and aprons and more. You can sew clothing, such as costumes, children’s dresses, or doll clothes. People need help storing and organizing their everyday household and office items. While a coffee cup or plastic bin can do, many people like to buy unique decorative items. Ideas include wood or painted glass utensil holders, pencil holders, decorative boxes for storing files or photographs, and more. Are you handy with a paintbrush? Painted dishes, cups and glasses, especially wine glasses are very popular. Or perhaps you can etch on a beer stein or mason jar. Instead of paint or etching, you can use decoupage to decorate kitchen items. Decorative dishes, mugs and glasses make great gifts, which makes them a great item to create. Many people in business like to buy personalized magnets, buttons or pins to give away to potential customers. Or you can make your own unique item and start a trend (remember bottle cap magnets?). People love their pets. And they love to spoil their furry friends, so making a home business in the pet market is a good idea. Items you can make for the pet market include pet beds, clothes, and collars. Plus, you can create decorative items, such as art or a locket that can hold the pet’s picture. Price your items for profit. While you don’t want to overprice your goods, you want to be careful that you cover not only the cost of materials, but your time as well. Brand your items. Find a way to include your name, business name, website or other contact information on each of your items. This can be a sticker or home-printed information on business card paper. If your customers want more, they’ll be able to get in touch with you. Consider targeting a specific type of customer. For example, many authors seek out unique swag items that have pictures of their books on them such as earrings, charm bracelets, and more. Sheepdog owners want to buy totes, tees, keychains and other items with a sheepdog picture on them. Customizing your goods can take more time, but you can also charge more. Tie into the time of year. While many of your items can be good at any time of year, you can boost sales by offering seasonal items such as Christmas décor or gift items, or Fourth of July decorations. Or consider making special occasion items such as wedding favors or birthday decorations. Once you have your items created, you're ready to sell them. The good news is you have lots of opportunities to sell your goods, and in some cases, you don’t even need to leave home. You can also set up your own e-commerce storefront to complement your listings on these sites, or instead of using any of the online craft resources listed above. Online isn't your only option to sell items. Plus, selling in person means no hassle of packing and shipping. Another important benefit of in-person selling is the face-to-face interaction you'll get with your customers. This allows you to get instant feedback, find out what your customers love about your products, and ask for ideas on new products your customers would be interested in buying from you.